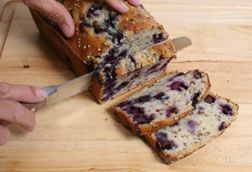 Homemade Blueberry Nut Bread is easy to prepare and tastes great. 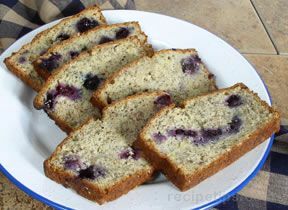 Blueberry Nut Bread serves as either a breakfast bread or dessert bread. 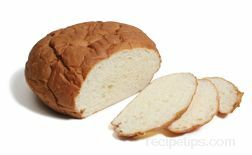 Follow these simple instructions to create a bread that your family will love. 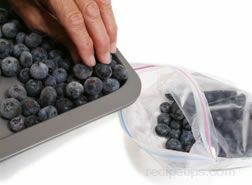 If using fresh blueberries, carefully pick through and discard any that are moldy, crushed, soft or shriveled. If there are any stems still remaining on the berries, remove them and discard. Gently swish in cold water and then allow the berries to drain. Pat berries dry with paper towels. If using frozen blueberries that you froze yourself, they should not have been rinsed before freezing. These blueberries should be rinsed quickly under cold water, drained and patted dry. 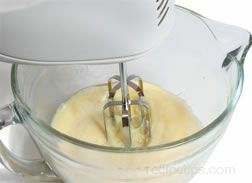 Then place back in the freezer until just before they are to be added to the batter. 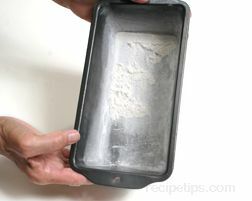 Grease and flour a 9 x 5 x 3 inch loaf pan or two 8 x 4 x 2 1/2 inch pans and set aside until batter is finished. 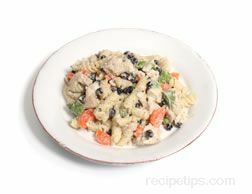 Preheat oven to 350° F.
Make a well in the center of the dry ingredients. Set this bowl aside. Beat these ingredients on low until they are well blended. 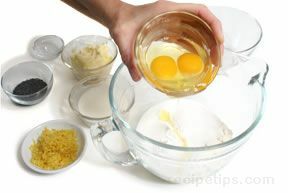 Pour egg and milk mixture into the well of dry ingredients in the other bowl. 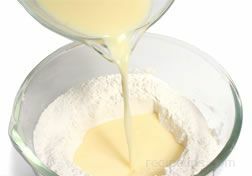 Stir the outer edges of dry ingredients into the egg and milk mixture. Stir only until all the dry ingredients are moistened. 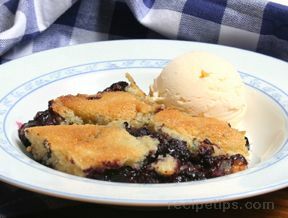 Fold in 1 1/2 cups of blueberries. 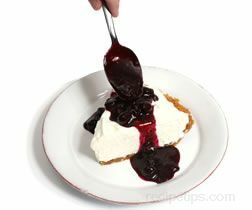 If using frozen blueberries, do not take out of freezer until just before adding to prevent them from bleeding into the batter. 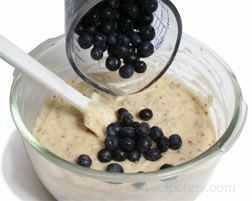 Gently fold blueberries into the batter just until evenly distributed. 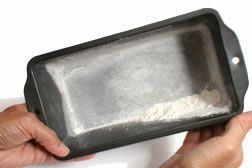 Place the batter in the greased and floured loaf pan. Lightly press batter evenly into the pan. 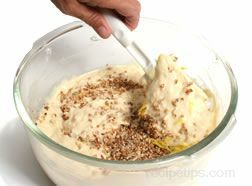 Sprinkle the top of the loaf with the pecan crumbs that were set aside. 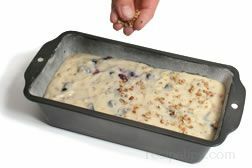 Place in the preheated oven and bake for 60 to 70 minutes if using a 9 x 5 x 3 inch loaf pan and for 40 to 50 minutes if using two 8 x 4 x 2 1/2 inch pans. Do not overbake. 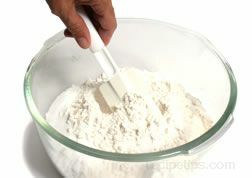 Check for doneness by inserting a toothpick into the center of the loaf. If it comes out clean, the bread is done. 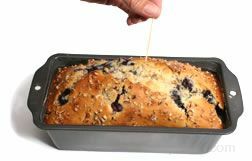 Allow the bread to remain in the pan and place on a rack to cool. 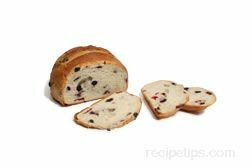 When loaf has cooled, remove from the pan, slice and serve or wrap in a plastic bag to store until ready to serve. 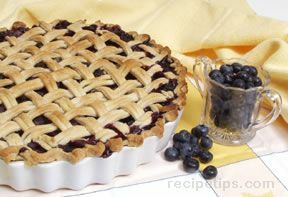 Note: When blueberries are cooked in a recipe containing a fair amount of baking soda, the berries will have a tendency to turn a dark greenish brown color. The baking soda creates an alkaline environment, which causes the yellow pigments in the blueberries to turn green. 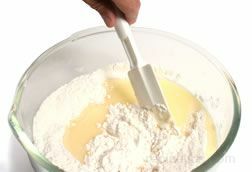 The baking soda is used to counteract acidity of ingredients, such as yogurt and buttermilk. 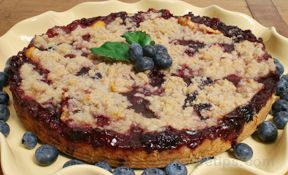 To eliminate the discoloring of the blueberries, substitute the same amount of milk as what is called for in buttermilk or yogurt, and replace each 1/2 teaspoon of baking soda with 1 teaspoon of baking powder. 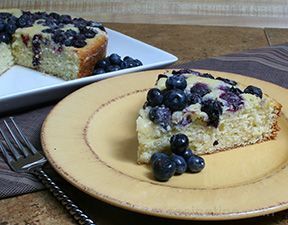 When adding fresh blueberries to a batter that the berries have a tendency to drop to the bottom, such as in a cake batter, sprinkle the blueberries with flour before adding to the batter. 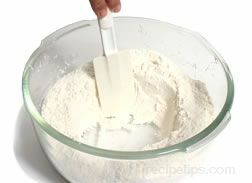 The flour will help prevent them from dropping in the batter. 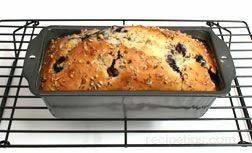 When baking with blueberries, they should be the last ingredient added so that they do not get over mixed and begin to break up. 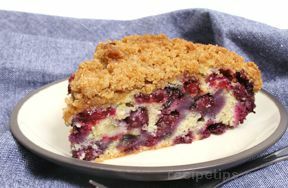 Broken berries will cause streaking in the batter. 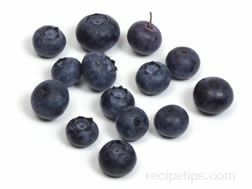 One pound of blueberries is equal to 2 1/2 to 2 3/4 cups fresh or frozen blueberries. One pint is equal to 2 cups of berries. A 10-oz. package of frozen blueberries equals 1 1/2 cups. 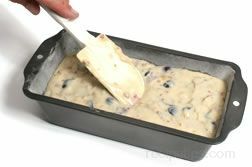 When adding frozen blueberries to a batter, add them to the batter while they are still frozen to prevent them from bleeding into the batter. 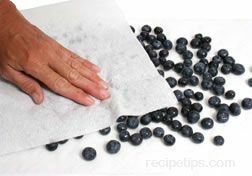 When using canned blueberries, be sure to drain well and the pat thoroughly with paper towels to prevent blue streaking in your recipe. 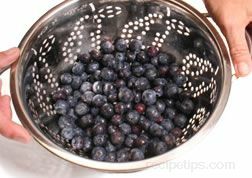 Add a little lemon juice to blueberries to enhance their flavor.